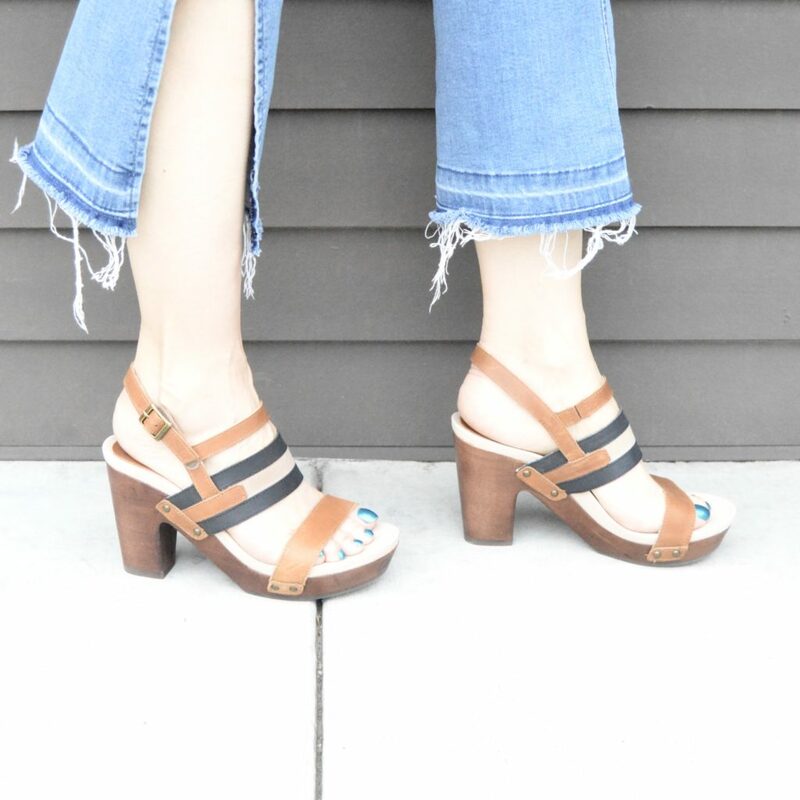 No one does comfortable heels like Jambu Footwear. Seriously, I could teach in these heels all day, though let’s be honest … I’d rather shop in them all day! This is a sponsored post. All opinions are all my own. The Viola is part of the handcrafted collection at Jambu.com. I’m loving the cool details, like the wooden block heels and the flat nail heads. The upper is soft nubuck and comes in these rich colorblock neutrals, but you need to check out the fun coral and teal colorblock version as well. I seriously had the worst time trying to choose between these two color choices! Well, whichever shades you pick, your feet will be happy with the memory foam bed and All-Terra traction. And remember my readers can take 20% off with the code FASHION18 when you shop at Jambu.com, including heels and new arrivals! This is what I would call a California casual look. It’s all about the jeans with the fun split hem flares that show off the fabulous Viola shoes! 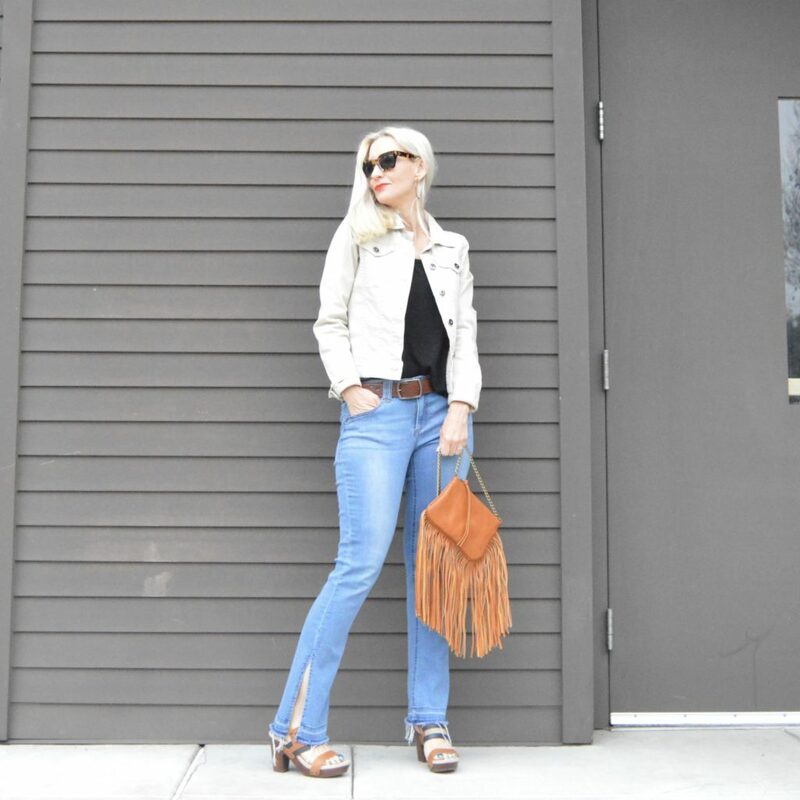 I kept the top simple and modern with a black tank and beige denim jacket, great spring staples. 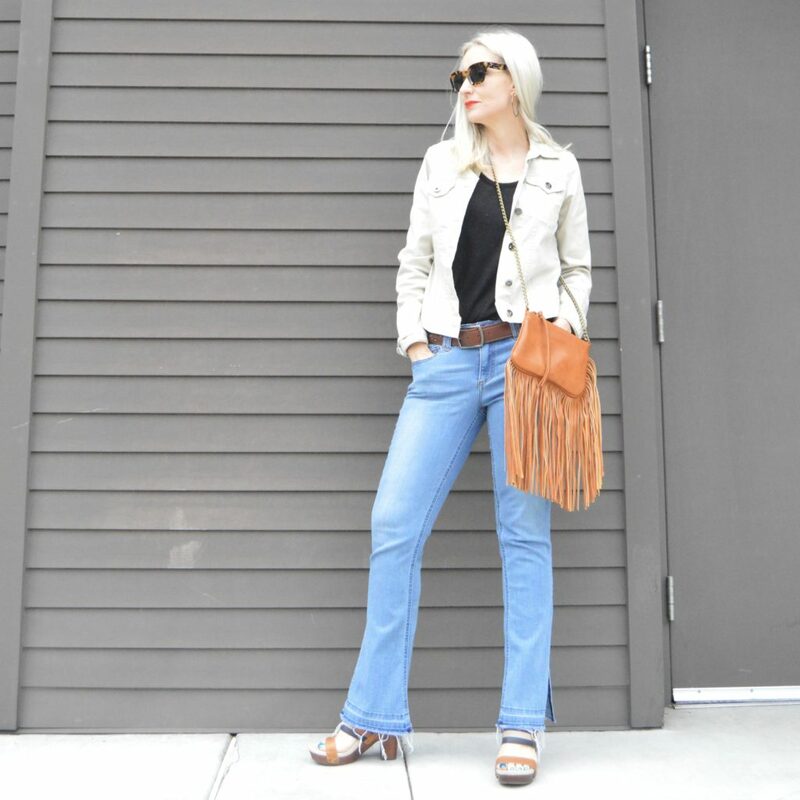 I added the fringe bag for a pop of fun that echos the 70’s vibe of the shoes and the flares! This is the kind of outfit I could pretty much live in all spring long! Need a reminder of why Jambu shoes are the very best? Watch this!! Also, I hope you caught my other reviews of Jambu’s fabulous spring offerings, like the Gina heels and Rio sandal! 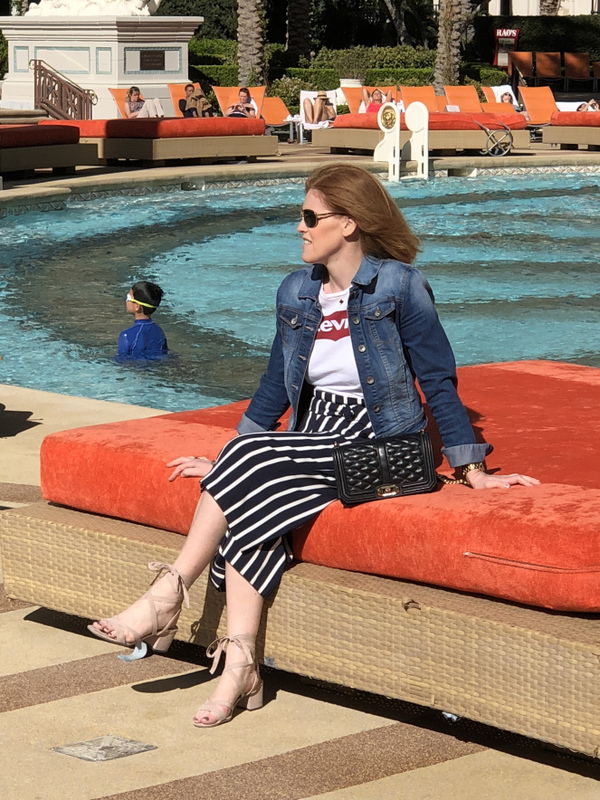 I’m loving Christine’s chic, trendy, casual look for her trip to Las Vegas. Be sure to check her out on Bon Chic Style! Link Ups: Visible Monday! Shoe and Tell! #iwillwearwhatilike link up! Hello Monday! Mix It Monday! How I Summer! Creative Mondays! Turning Heads Tuesday! Confident Tuesday! On Trend Tuesday! Style Perspectives! Trendy Wednesday! Style on the Daily! What I Wore! Jersey Girl Texan Heart! Color and Grace! Thursday Fashion Files! Chic and Stylish! Labour of Fashion! Thursday Favorite Things! Thursday Moda! Top of the World Style! Welcome to the Weekend! Passion for Fashion! Fabulous Friday! Fab Favorites! Flashback Fashion Fridays! Weekend Wear Link Up! Edge of the Week! Nancy’s Fashion Style! Ladies Who Link Up! I love my pair of Jambu shoes like these, Dawn! And the funny thing? I just bought jeans almost like this only the split is in the front!!! Talk about great minds thinking alike!! Such great shoes! I love everything about them! And how wonderful that they are comfortable! Thanks for the link up & Happy Weekend! Super comfy … so important! Love the multi-colored heels! Hope you have a great weekend! Great shoes, love the boho feel! Have a great day! They have mastered comfortable and stylish! I love how you styled them with the slit jeans and that fun fringe purse! Aww that’s sweet … thanks Lisa! You’ve totally nailed the 70s look – trust me, I was there! Hugs, x.
Aww thanks so much, Jacqui! This is a super cool look and just my style. I love every detail and those shoes are so fabulous! You would look fabulous in this look, Cheryl! Those are so cute! I love them! Love the comfy and chic sandals! Also crushing on those denim jeans! Happy almost weekend! Aren’t these jeans fun? They don’t have the exact same ones anymore, but I found some similar. I like the split hem to show off shoes! Great fashion minds think alike! 😀 Thanks for joining us! Love the wooden heel on these sandals! Thanks for sharing and for the link up! Very nice outfit and great heels! I love these heels, I was deciding between these and the Gina, and these colors/style caught my eye. looks great! Thanks, Jess! Have a great weekend! Those sandals are so stinking cute—I can’t believe they’re comfort shoes! Oh this bag is adorable! I love the fringe and this chic boho look! Fabulous sandals! I love the long fringe bag too! Better late than never in linking up! Fridays are tough for me. Love your sandals, especially the two different color leathers – so unique! And that bag is the bomb!